The Diplomat is fully committed to protecting your privacy. This privacy statement explains The Diplomat’s data collection and use practices for the magazine. By accessing The Diplomat, you are consenting to the information collection and use practices described in this privacy statement. The Diplomat will ask you when necessary for personal information that can personally identify you (personal information) or that allows us to contact you to provide a service or carry out a transaction that you have requested such as requesting information about our magazine, entering a contest, subscribing to our newsletter, providing details for an event, submitting work to The Diplomat or requesting information about the magazine. The personal information we collect may include your name, home address, country, school name, e-mail address, or phone number. The Diplomat may collect certain information about your visit to our site, such as the name of the Internet service provider and the Internet Protocol (IP) address through which you access the Internet; the date and time you accessed The Diplomat; the pages that you access while at The Diplomat and the Internet address of the Web site from which you linked directly to our site. This information is used to help improve our magazine, analyse site trends, and for administration of The Diplomat. When posting comments to The Diplomat, we urge you to be careful only to enter information on your profile that you are comfortable sharing with the public at large.Please keep in mind that if you disclose personal information through public online discussions on The Diplomat, this information may be collected and used by others. We would recommend against giving out personal information to strangers online, which they may use for illegal or harmful purposes. The personal information collected on The Diplomat will be used to operate the website and to provide the service(s) or carry out the request(s) you have requested or authorized. 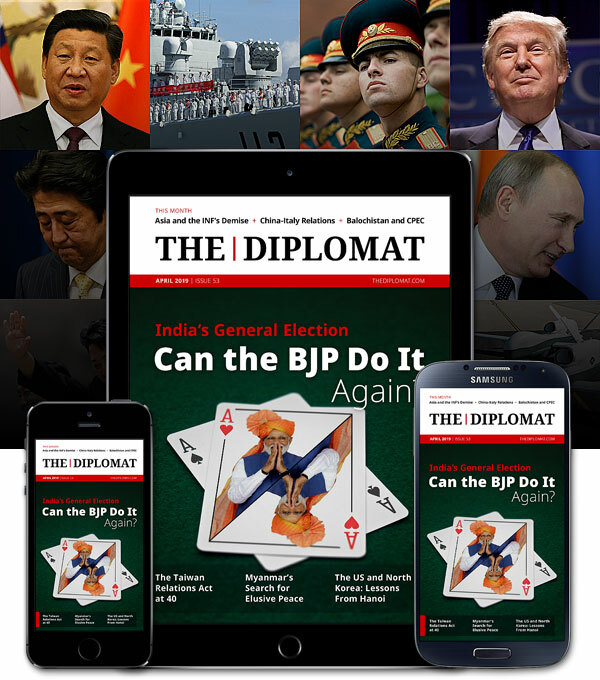 In support of these uses, The Diplomat may use personal information to provide you with more effective services, to improve the magazine and any related products or services, and to make The Diplomat easier to use. We may use your personal information to provide you with important information about the service that you are using, including updates and latest news. Additionally, with your permission, we may send you information about other The Diplomat services, and/or share information with our partners so they may send you information about their services. The Diplomat occasionally hires other companies to provide limited services on our behalf, such as Web site hosting, delivering prizes, answering questions about services, and sending information about our magazine. We will only provide those companies the personal information they need to deliver the service. They are required to maintain the confidentiality of the information and are prohibited from using that information for any other purpose. The Diplomat may disclose personal information if required to do so by law or in the good faith belief that such action is necessary to (a) conform to the edicts of the law or comply with legal process served on The Diplomat; (b) protect and defend the rights or property of The Diplomat and our family of Web sites; or (c) act in urgent circumstances to protect the personal safety of The Diplomat employees or agents, users of The Diplomat services, or members of the public. Personal information collected on The Diplomat may be stored and processed in Japan or any other country in which The Diplomat or its affiliates, subsidiaries or agents maintain facilities, and by using The Diplomat, you consent to any such transfer of information outside of your country. Except as otherwise described in this statement, personal information you provide on The Diplomat will not be shared outside of The Diplomat and its controlled affiliates without your permission. Please be aware that this privacy statement and any choices you make on The Diplomat will not necessarily apply to personal information you may have provided to The Diplomat in the context of other, separately operated, The Diplomat services. Customer information is collected by The Diplomat team. The Diplomat is committed to protecting the security of your personal information. We use a variety of security technologies and procedures to help protect your personal information from unauthorized access, use, or disclosure. One of the main purposes of cookies is to save you time. If you navigate within a site, for example, a cookie helps the site to recall your specific information on subsequent visits. This simplifies the process of delivering relevant content and makes site navigation easier. When you return to the web site, the information you previously provided can be retrieved. You have the ability to accept or decline cookies. Most web browsers automatically accept cookies, but you can usually adjust your browser setting to decline cookies if you like. If you choose to decline cookies, you may not be able to fully experience the interactive features of this or other web sites you visit. We may occasionally update this privacy statement. When we do, we will also revise the ‘last updated’ date at the top of the privacy statement. We encourage you to periodically review this privacy statement to stay informed about how we are helping to protect the personal information we collect. Your continued use of the service constitutes your agreement to this privacy statement and any updates. The Diplomat welcomes your comments regarding this privacy statement. If you believe that The Diplomat has not adhered to this privacy statement, please contact us by email at [email protected] or via mail at the address provided below, and we will use reasonable efforts to promptly determine and remedy any problem.